If you compile your own software you probably know that GCC comes bundled in the rather large Xcode package, but what if you just want to have gcc and LLVM without installing the entire Xcode package? Apple now offers an option to do just that, and it’s called Command Line Tools, available as a separate download from Apple Developers. You’ll need a free developer login to access the download, login and look for “Command Line Tools for Xcode”. 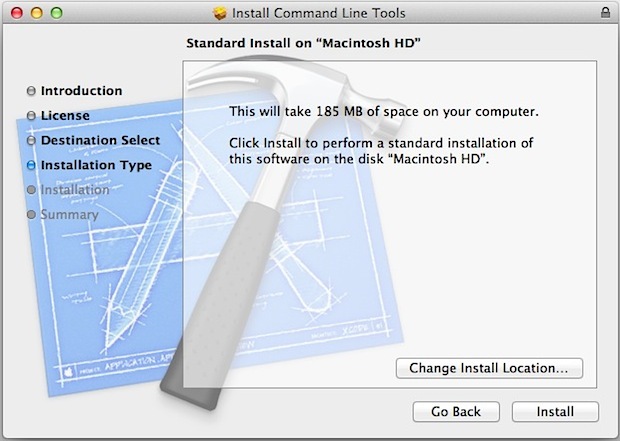 Mac OS X 10.7.3 or later is required to use the package installer. The download is less than 150MB and that alone will save plenty of bandwidth, but the total installation is also significantly smaller than Xcodes footprint and you’ll save a ton of disk space if you just want the command line compiler tools without all the iOS and OS X development support. If you already have Xcode installed you won’t need this because it’s an option during the general Xcode installation, meaning this is really just for advanced Mac users that want the familiar unix compiler toolkit; Make, GCC, LLVM, python, perl, and other development utilities. If you want to slim down your development footprint, you can always uninstall Xcode by deleting the app from /Applications/ and then manually install the Command Line Tools for OS X separately. Great! I use Qt and never really needed all the XCode baggage – Thanks for posting this! Thanks a lot. Works fine. Now the August-Package is available. Thanks for the that useful bit of info! I hate installing stuff I don’t need!